Budurail, Kathal Road, Silchar, Assam. PRT (English) - Graduate/Post Graduate with B.Ed or equivalent qualification having minimum three years of teaching experience. Pre-Primary Teacher - Graduate/Post Graduate with Montessori/Nursery Training/B.Ed. Should posses patient and polite nature. Experienced candidates capable of handling kids with care and affection will be preferred. Music Teacher (Vocal) - B.Mus/M.Mus from a reputed institution with par excellence in organizing connects and training students efficiently. Experienced candidates will be preferred. 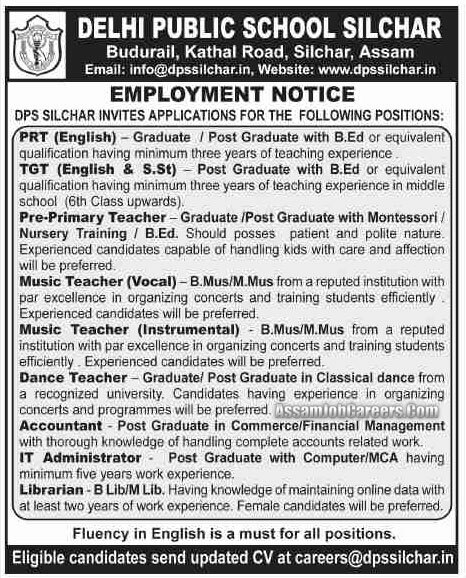 Music Teacher (Instrumental) - B.Mus/M.Mus from a reputed institution with par excellence in organizing concerts and training students efficiently. Experienced candidates will be preferred. Dance Teacher - Graduate/Post Graduate in Classical dance from a recognized university. Candidates having experience in organizing concerts and programmes will be preferred. Accountant - Post Graduate in Commerce/Financial Management with through knowledge of handling complete accounts related work. IT Administrator - Post Graduate with Computer/MCA having minimum five years work experience. Librarian - B.Lib/M Lib. Having knowledge of maintaining online data with at least two years of work experience. Female candidates will be preferred. Fluency in English is a must for all positions.